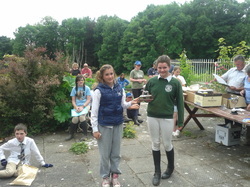 Sligo Pony Club Camp 2013 from July 5th to 13th . A fantastic week held in the glorious sunshine on the grounds of Annaghmore estate will leave the Sligo Pony Club riders with a week of memories which they will never forget from Pony Camp 2013 . Approximately 30 young riders ranging from 8 to 16 took part in a series of activities including stable management ,pony care , dressage , cross country showjumping and eventing , pony games and hacks . With the excellent instruction at 4 different levels on hand each day the young riders were allowed to progress each at their own level in a safe and supportive environment where enjoyment and confidence building were top priorities . All activities were carefully planned and organised by the Pony Club Committee under the guidance of DC Felix Burke and assistant Jean Norris . All parents were on hand throughout the week to lend voluntary assistance with catering , cleaning , evening entertainment and general assistance as required .